Disaster Recovery: Case Management — Capital Access, Inc. In October 2013, the Superstorm Sandy New York City Housing Recovery Office (HRO) in charge of the Build-It-Back housing programs requested Capital Access lead an Operations Management Team to improve and expedite homeowner application processing for over 14,000 homeowners. 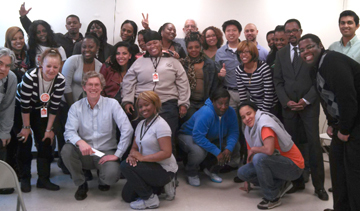 In less than 30 days Capital Access mobilized 22 housing and disaster recovery professionals that trained and coached 75 existing contractor intake specialists to complete 3,200 Homeowner applications over four months. Our approach identified existing and potential program processing bottlenecks and created policy and systems to resolve the multiple household and property issues that delay eligibility determination and applicant decisions. We de-mystified what homeowners needed to do to move from initial application to grant signing. We drafted policy guides, Frequently Asked Questions and Standard Operating Procedures for the Acquisition, Repair, Repair and Elevation, Rebuild, and Reimbursement programs including the grant award and signing process. We coordinated and lead the first grant signings for approved applicants in less than four months. Subsequently, the New York State Governor’s Office of Storm Recovery (GOSR) procured Capital Access to provide program design, policy and case management services for its Acquisition and Buyout program. Capital Access locally sourced case managers and administrators to provide immediate intake through closeout processing for over 400 property owners across four NYC boroughs. We assisted in meeting Section 3 goals by locally sourcing staff and vendors to provide property inspection, tenant relocation, title and settlement services in support of the combined NYC and NYS Buyout and Acquisition for Redevelopment programs. We designed and implemented an interim System of Record to align and transfer data between two CDBG-DR Grantees with multiple buyout zones and programs. When the GOSR NYC acquisition program processing was near completion, NYC HRO requested our acquisition case management program processing services to assist ongoing processing of new or delayed buyout and acquisition sites. Capital Access staff have assisted in successfully managing over 150 acquisitions.